Here are some of the usual questions we hear on a day to day basis. Click on one of the questions below or just scroll down. » How often should I have my facility cleaned? » Why should I use a professional specialty company like Data Clean? » Do I have to shut down my operation to have my facility cleaned? » Do you work on weekends and at night? » Why should I clean my controlled environment? » What is a controlled environment? » Why can't my regular maintenance people take care of my clean room? » How long have you been doing clean room maintenance? » Can you give me a good definition of the different clean room classes? How often should I have my facility cleaned? It depends on how clean you need it to be and how much contamination is introduced to the facility by the activities conducted within the facility. Some facilities are cleaned daily, or more often (i.e. before each shift), while others are cleaned on a yearly or even less frequent basis. Some general guidelines are below. Why should I use a professional specialty company like Data Clean? Today's computers and servers are better, faster, and smaller than their predecessors. Today's equipment is also more sensitive to contamination. Smaller form factors and lead pitch make bridging and intermittent connections more possible. Higher component density means higher power density and increased vulnerability to overheating. Both of these sensitivities can be minimized by keeping equipment clean. Maintaining a clean environment is the smart way to keep the equipment Clean. Data Clean was literally started as the result of a data center disaster. Untrained and ill-equipped custodians tried to clean a dirty data center. Despite their best efforts, their lack of training and proper equipment resulted in unintended downtime. Not only do Data Clean technicians have the equipment, materials, and training to get the job done right, Data Clean backs up the field crew with a knowledgeable support staff, financial resources, and appropriate insurance for your peace of mind. Data Clean is the Smart choice for your critical environment services. Today's servers, routers, and telecom equipment utilize subminiature electronic assemblies to realize their amazing performance characteristics. But, the small size of the electronics makes this equipment especially vulnerable to contamination, failures, and down time. Large contaminates can cause electrical shorts. Certain particles are corrosive. All particles, visible and barely visible, can combine to clog vents and heat sinks. Symptoms of contamination-related failures include overheating, power-supply failures, unexplained system glitches and frequent restarts. A regular cleaning schedule with Data Clean is essential to assuring long component life and uptime. Data Clean smart makes the difference in equipment reliability. The computer room is arguably the most sensitive physical infrastructure investment of an enterprise and should be protected. These critical facilities cost millions of dollars, but simple contamination can be crippling. Contamination can cause excessive energy usage and wear on critical components. Contamination can void vendor warranties, and the cost to repair failed equipment far exceeds the cost to keep the facility clean. World-class organizations value clean facilities. Having a Data Clean "smart environment" says a lot about you - to coworkers and to customers. The air inside Data Centers is recirculated and reused to maximize the cooling investment. The people who work in these rooms are subjected to increasing levels of contamination and potential illness. Besides the negative physical impact, a dirty data center has a negative psychological impact as well. Real or imagined, environmental contamination can cause low productivity and absenteeism. A clean working environment is invigorating and inviting. Data Clean smart delivers. Do I have to shut down my operations to have my facility cleaned? No. Shutdowns and downtime are a concept of the past. Our technicians work around your operations and your staff. Of course certain activities will require unrestricted access to your work area, applying a finish to a VCT floor for instance. Special consideration must be given to dangerous equipment or other hazardous situations. Do you work on weekends or at night? Yes, we work 7 days a week..24 hours a day. We try to accommodate every customer's schedule request. Again the short answer is, it depends. Why should I clean my controlled environment? Typically, the equipment within a controlled environment is special and requires its own environment. An environment will not stay clean by itself. Also, personnel may be subjected to reduced fresh air because of the controlled environment. All of these areas are typically overlooked by the regular custodial staff. All of these areas need to be cleaned just like any other area of the building. And in the case of special contamination requirements, the area will need to be cleaned more often. Cleanrooms, computer rooms, telecom/datacom closets or termination rooms, telecom/datacom switching centers; cable head ends; cellular communication shacks and hubs; specialized production environments; laboratories; biomedical facilities, clean rooms, CLASS 10 and under. Why can't my regular maintenance people take care of my clean room? Regular janitorial service is not enough. In most cases your regular janitorial service cannot provide the level of service your facility requires. Your data processing center needs a preventative maintenance program carried out by trained and experienced professionals. The second someone enters your data center, they start evaluating your facility. An impeccably clean computer room sends a clear message that you run a first-class operation. this obvious level of professionalism will be noticed - and respected - by both your customers and management. How long have you been doing cleanroom maintenance? Since 1979 Data Clean Corporation has provided it's clients with the highest level of computer room cleaning possible. as the industry leader in computer room preventative maintenance, Data Clean has helped thousands of clients - including IBM, Unisys, Rockwell International, State Farm Insurance and AT&T - increase productivity. And at the same time, saved their clients money by reducing downtime and the loss of data. Can you give me a good definition of the different Clean Room Classes? Clean Rooms and other critical environments are generally specified by their class of cleanliness. While there are many classification systems, the most common is the level of airborne contamination and the globally adopted reference standard for this is ISO14644-1. This standard has replaced the popular US Federal Standard 209E which was roughly similar but less comprehensive. The standard defines the classes, how to measure them and how to report them. It requires measurement of several different size particles from 0.1µm to 5.0µm in various locations within the facility. By measuring how many such contamination particles are in a cubic meter of atmosphere, you define the class. The bigger the number, the dirtier the room. Typical for a computer room. Besides restricted access and positive pressurization, no special garments or procedures are required. Typical for a hospital operating room. Some types of factories use this class of room. Clean Room coats or bunny suits, head covers and booties are required. Air enters the room through HEPA filters. (High Efficiency Particle Accumulation) Access is restricted. Room is positively pressurized relative to surrounding space. 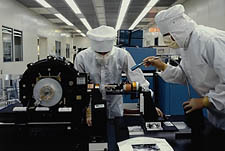 Typical for making computer disk drives or other sensitive materials. Same rules as Class 10,000 but workers are required to wear gloves and full hoods as part of the clean room wardrobe. More frequent air changes in the room. Again, all air is constantly filtered through HEPA filters and the number of air changes per hour is very large. Typical for special semiconductors like computer memory. Also used for some pharmaceuticals. Same idea as above, just more stringent. Full face masks are required here. Required for large semiconductor fabrication where even the slightest amount of contamination will cost a lot. Workers wear complete suits, with face masks. Breathing is done through a respirator to filter workers' breath and prevent breathing from contaminating the space. In general, all of these facilities have the air directed from HEPA or ULPA filters straight at the work. The term is "product gets first air". This means that the air is the cleanest as it leaves the filter and that cleanest air should come in contact with the product being manufactured before coming in contact with anything else - especially people. The closer the product is to the source of filtered air, the more likely it is that the product will be as clean as possible.